It was early on the second day, before sunrise. Having some trouble sleeping, I decided to withdraw Vivillon, Pikachu, and Torchic from my PC and head back to Route 22 to try and catch some of the Pokémon I’d missed. I managed to capture a Litleo and a Bidoof before having to go back to town since I’d run out of Poké Balls. Along the way, I began to see the results of my training on my Pokémon, specifically Vivillon. I’d spent so much time on him specifically, trying to get him to evolve into what he is now, that his strength was much higher than the others. Still, I felt the need to get the rest of the team up to his level. After all, one should never depend on a single Pokémon to save them ALL THE TIME. Still, these were thoughts better dwelled upon in the morning, so I went back to bed. 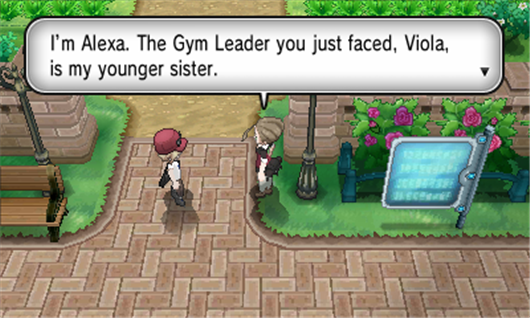 After getting up to officially start my day, I found myself face-to-face with Viola’s older sister, Alexa. She seemed interested in my skills, and thus handed me the new model for the Exp. Share, which gave every Pokémon not in battle 50% of the experience the one actually involved received. Combined with my training regiment, my team was now becoming MUCH stronger, though I suspected there was a bigger reason for it. Either way, though, I made my way to Route 4, also known as Parterre Way, and managed to catch a Budew, Ralts, Ledyba, and Flabébé. After battling a few more Trainers, and learning some new tricks on my roller blades, I ran into two of Professor Sycamore’s assistants. 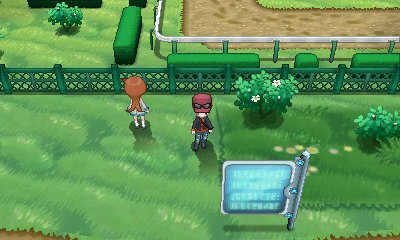 They gave me the TM 27, which I used to teach Fletchling the move Return, and told me how to get to the Professor’s lab. Following the assistants, I found myself in the most gorgeous city I’d ever seen: Lumiose City. Granted, I couldn’t explore much of it due to some sort of power outages, and seemingly every other store was a café, but it was still so grand. There was even a salon, where I was able to get my hair tinted orange, and a building that recorded a 10 second video for Trainers who might meet me online. Once all of that was taken care of, though, I made my way to Professor Augustine Sycamore’s lab…A fairly LARGE lab, to be honest. As I understand it, most Pokémon Professors tend to enjoy smaller labs in quainter towns. I guess Sycamore must really love the city life, and upon meeting him, he certainly seemed flamboyant enough to fit right in here. 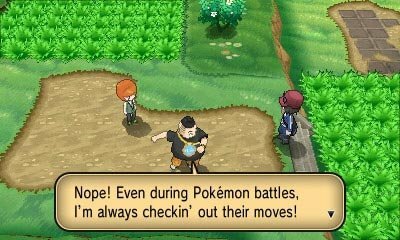 He admitted that he was only planning to enlist the other four for this mission, but upon hearing I was moving to Kalos with my mother (likely due to her fame as a Rhyhorn rider), he decided the best way to get me adjusted was to have me travel the region and see as many new sights and Pokémon as I could. Soon enough, I was joined by Serena and Shauna. They stood watch as Sycamore challenged me to a battle, to test my skills. I was rather surprised to find that the Professor’s team consisted of Bulbasaur, Squirtle, and Charmander, three Pokémon that, while part of the Kalos Regional PokéDex, were more commonly seen in Kanto. Still, even with his vastly superior knowledge of Pokémon, his team wasn’t nearly as experienced as mine was quickly becoming, and I was able to defeat him, with Torchic gaining enough experience to evolve into Combusken. After this, he offered the three of us one of the Kanto Pokémon. My gut was telling me Charmander, but since I already had a Fire-type, and Pinhead was pulling his weight as my Grass-type, I decided to go with Squirtle, the Water-type. I named him Michelangelo. He was carrying a strange stone, very similar to the one Combusken had. It was at this point, as Tierno and Trevor finally caught up with us, that Professor Sycamore told us that he wanted us to discover the secrets of something called ‘Mega Evolution’, something I’d never heard of, but was apparently tied to these stones. After we learned this, the group had a small pow-wow of sorts, and it was at this point I really started to understand and appreciate what made each of them so different. Tierno just wanted to dance and have fun with Pokémon, all the while growing closer to them. Trevor was intent on completing the PokéDex, thus completing his commitment to the Professor and achieving a great collection. Shauna desired to create lots of memories with Pokémon, memories that would last their whole lives. And Serena was committed to growing strong with her Pokémon and mastering Mega Evolution. Each had their own unique goals, and aside from their love of Pokémon, they couldn’t be any more different…and yet, they were all close friends, standing by each other and supporting one another…and me. 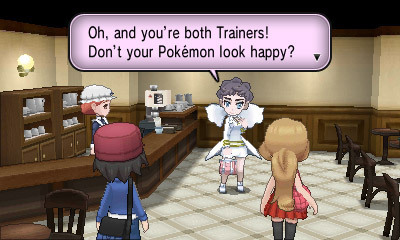 I couldn’t help but feel closer to them as a result, and I wondered if that was why Professor Sycamore chose them. Either way, I decided it might be best to follow up on the Professor’s suggestion and head toward Camphrier Town. As I was leaving the lab, though, I met a man named Lysandre, who apparently built the Holocaster, the device Trainers used to communicate over long distances…and yet, something about him rubbed me the wrong way. After speaking with him for a bit, Serena asked me to come with her to a nearby café, and it was there that I began to learn more about the man. Lysandre was there, speaking with a world famous movie star named Diantha, asking if she would prefer to stay beautiful like she was in her first film and keep making movies like that forever, but Diantha, like myself, seemed a bit disturbed by such a suggestion. After they left, Serena had an interesting proposition for me: She wanted to be my rival, so we could grow stronger together. How could I turn down such an offer? Making my way to Route 5, or the Versant Road as it’s called, I found myself face-to-face with a Lucario. It seemed…interested in me. Soon enough, its trainer, a Gym Leader named Korrina, skated by, and suggested that Lucario seemed to like something about my Aura, a spiritual energy believed to be the essence of every living creature. Lucario are able to sense Aura, as well as practically weaponise their own, so I felt special that this Lucario seemed to like mine. After they left, I wound up battling a pair of twins, Faith and Joy, and their Pokémon, Plusle and Minun. It wasn’t a hard battle, and I found myself enjoying the style of Double Battles, after which, both Fletchling and Pinhead evolved. Fletchling evolved into Fletchinder, a Fire/Flying-type with wings that would burn you if you touched it without permission, and Pinhead went from being a Chespin to a Quilladin, becoming far stronger as a result. However, just as I was feeling good about that, and liking the idea of battling multiple Pokémon at once, I wandered into some tall grass, where I was confronted by a horde of five Scraggy! I only had time to call out a single Pokémon at a time, making this a 5-on-1 handicap battle! But, as luck would have it, Squirtle had learned Bubble, which hit multiple targets at once. Using this attack, I picked off three of my targets, before I was forced to switch to Fletchinder. Fletchinder took down the fourth Scraggy, leaving the leader open to be captured. Having somehow survived that last encounter, I was feeling VERY lucky, and managed to keep that luck going, catching an Abra, Gulpin, Pancham, and Furfrou. After this, though, I took a look at my team, and noticed something bad: My team consisted of a Grass-type, a Fire/Flying-type, a Water-type, a Fire/Fighting-type, a Bug/Flying-type, and an Electric-type. Even though they were strong, too many types and their weaknesses were overlapping. I knew I’d have to start rotating Pokémon from here on out. It might slow training down a bit, but it was the only way to make sure my team was varied enough to compete with multiple sorts of opponents. As such, I made it a regular practise to return to the nearest Pokémon Centre often to switch team members in and out. Part 2 of Day 2 will be written in the morning. Right now, it’s late, and I’m tired. I’ll write Part 2 when I get up, and hopefully Part 3 won’t be nearly as long. Ja né!